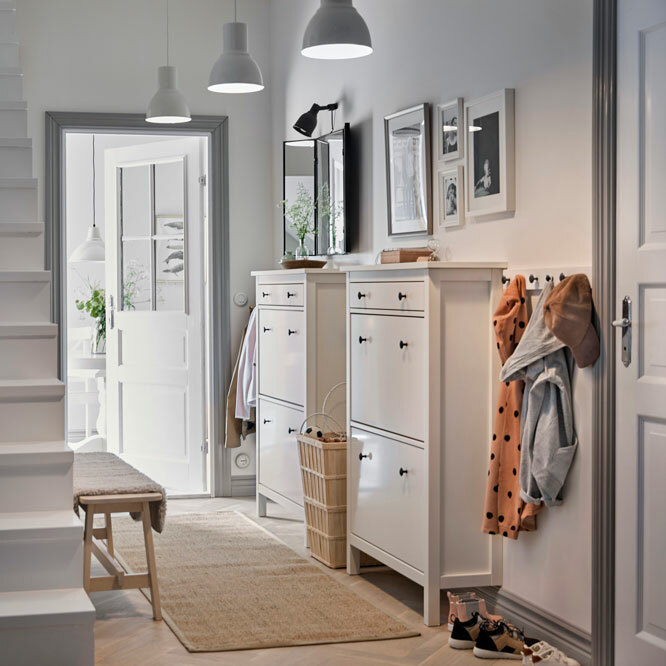 If you have a small-space corridor, always remember the HEMNES hallway furniture, such as shoe cabinets, benches and hat racks in Scandinavian traditional style. They stand or hang close up to the wall, help you with storage of coats and shoes, and leave the entire corridor's area for you. Yellow walls, lamps, and BOSNÄS footstools with storage are only a few of many bold accents in this house of colour-loving family. However, the hallway is a great example of minimalist interior. The MACKAPÄR coat racks, shoe organisers, and benches with storage represent the Scandinavian modern style. Small corridor and lots of storage space! A long narrow corridor in a countryside house is fully dedicated to storage. 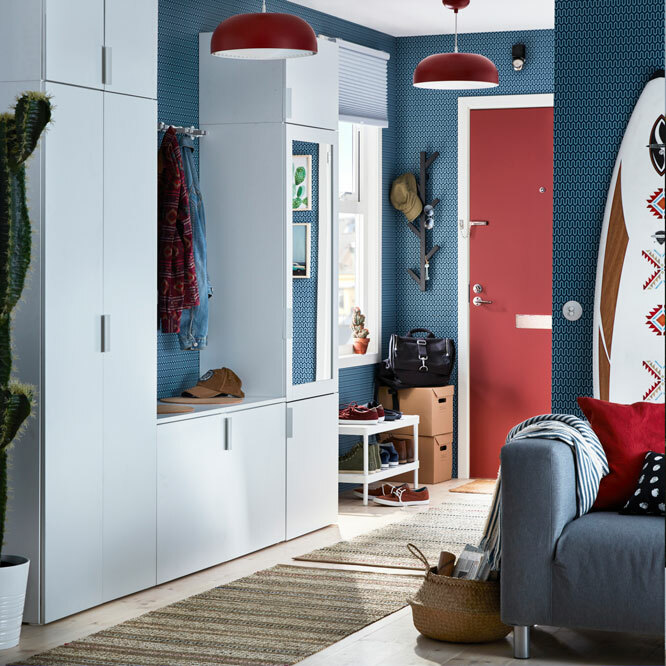 This hallway is functional and full of colours: patterned rugs and the STOCKSUND bench with storage space under its seat fits perfectly to the HEMNES open wardrobe and chequered wallpapers. 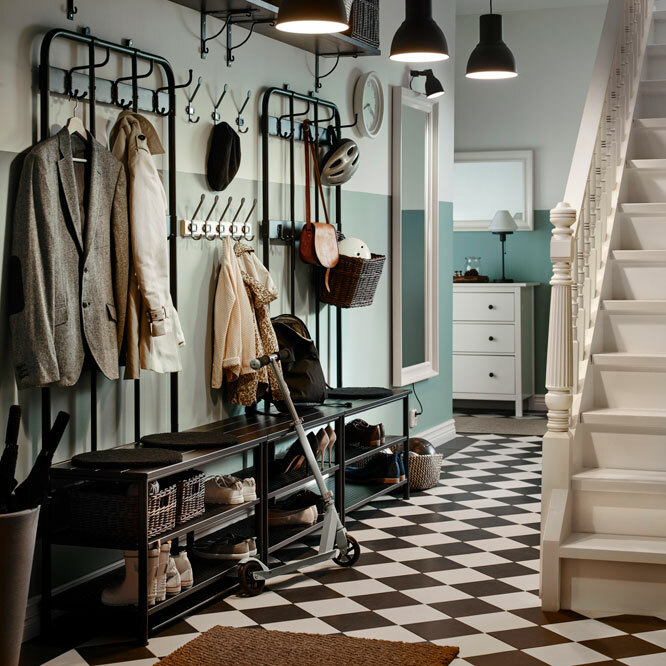 Try to utilise that forgotten corner next to your staircase to arrange a hallway. Maybe all it takes is just a high chest of drawers, PINNIG bench with shoe storage, and KÄMPIG swivel hooks on different heights. Then, it will be easier to reach them for both parents and their kid learning to be more independent. You don't need much money or space to arrange a hallway in your cottage. If you prefer a classic interior, choose HEKTAR pending lamps and traditional style hallway furniture. 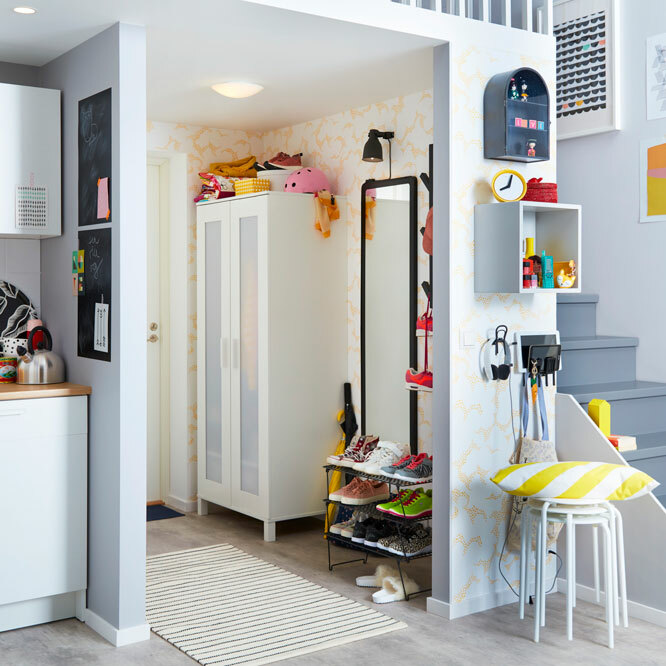 We recommend the PINNIG coat racks that help use every inch up to the ceiling and benches with shoe storage. The functional hallway furniture can easily turn a small entryway into a spacious storage. A student who lives in this rented apartment is a big lover of the streetwear shoes. So the main role in the hallway belongs to her GREJIG shoe racks that can be stacked and a roomy ANEBODA wardrobe. All the collection of shoes is hidden behind the semi-transparent door. This modern style hallway is a place where all the family members start their day. It is comfortable for both parents and children to get ready for school or work. Modern hallway furniture from TJUSIG series help keep this area in order and style. Besides, the benches, shoe racks, coat stands and hangers for walls are easy to reach even for the smallest ones. Need some space to store your clothes, shoes, sports equipment and other things? The PLATSA storage systems are a great solution for your modern style hallway. You can organise the inside with interiors from the HJÄLPA series – and for the exterior, there are smart solutions in the LÄTTHET series. 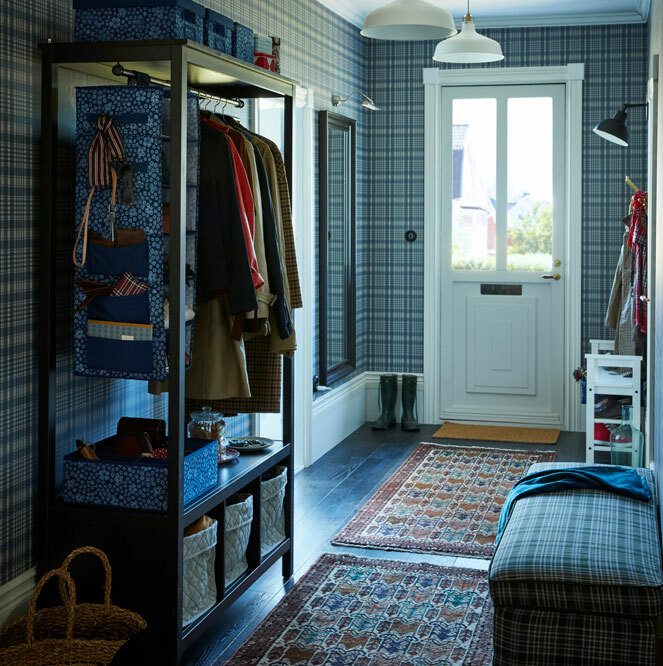 When the corridor is too narrow and there is no room for an integrated wardrobe, try to use every inch of the walls. This modern style hallway in a couple's apartment is a great example on how to use PINNIG hallway furniture instead of a standard wardrobe. 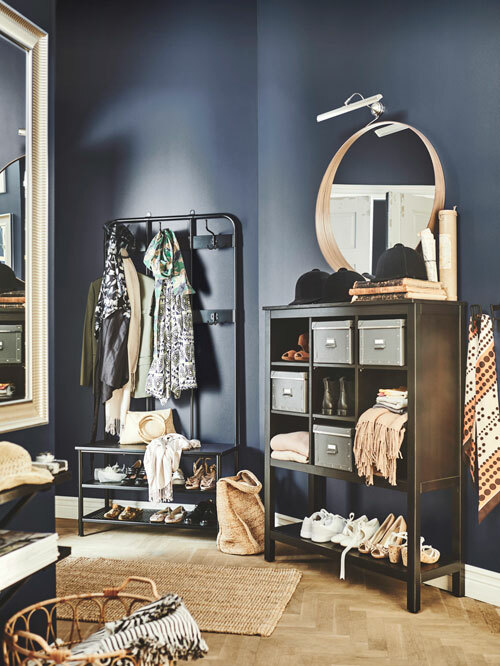 The couple who lives here has enough room for their coats and bags on the hanger, and the three benches help use the length of their corridor for shoe storage. 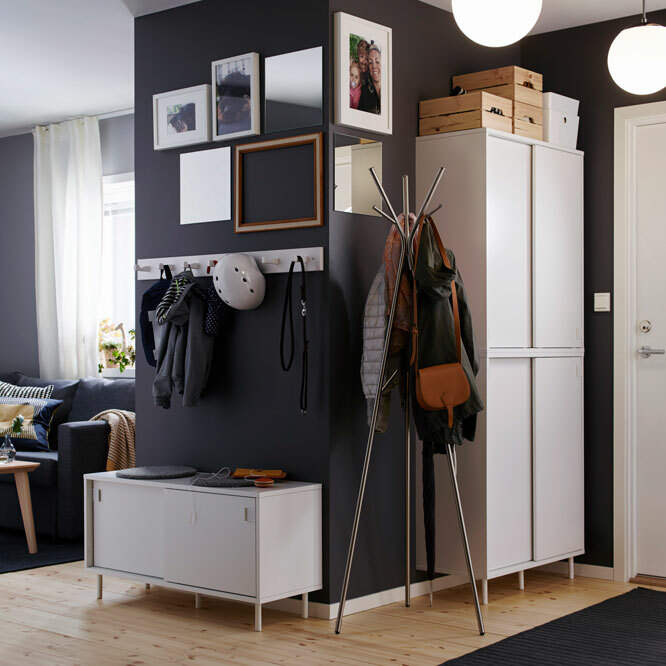 This Scandinavian style hallway in a rented apartment belongs to a single student. He doesn't need much room for storage, so he uses coat stands for all of his seasonal outdoor clothes and has two BISSA shoe cabinets that help him organise his shoes. It is easy to adjust the space in the shoe compartments by moving or taking away the dividers. This black-and-white interior features stylish and functional hallway furniture. 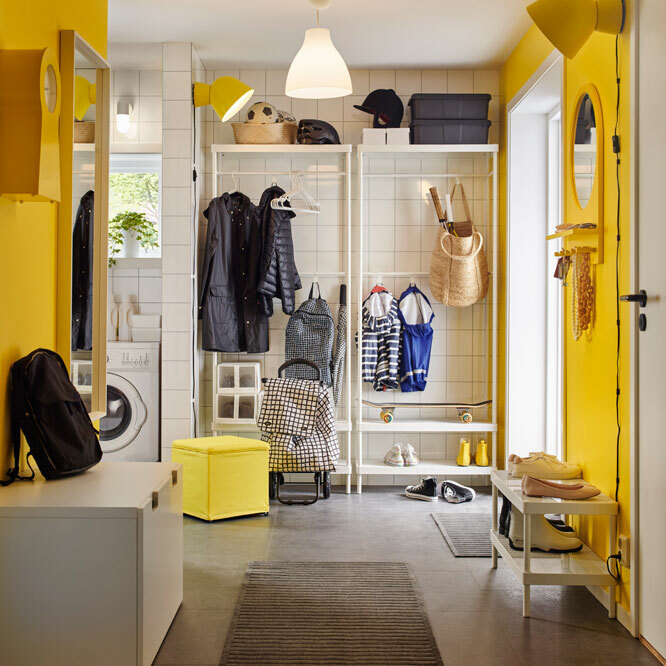 To make room for everyone's stuff, the family who lives here has even two hangers (one hat rack plus one KNIPPE coat stand) and a MACKAPÄR bench with storage for shoes. The bench is comfortable to sit and put on the shoes (very useful for living with children), and can also work as a table for keys and other small items. This traditional style family cottage welcomes guests with light pastels and Scandinavian style hallway furniture. 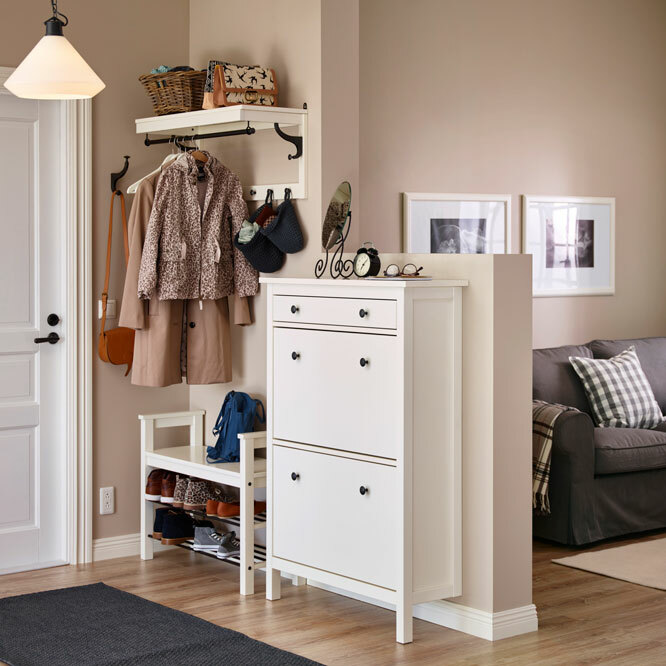 Behind the door of two high HEMNES shoe cabinets, there is enough room for the whole family's shoes. Racks with knobs are great for children's coats. And the wooden NORRÅKER bench makes their morning routines so much more comfortable. 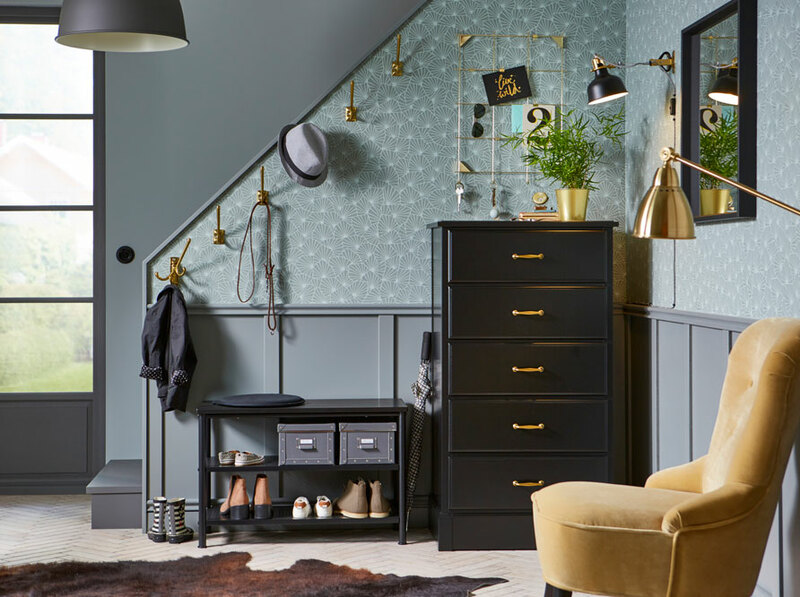 When you love clothes and could really compete with a fashionable vintage shop, make a statement and show off your collection in open storage. 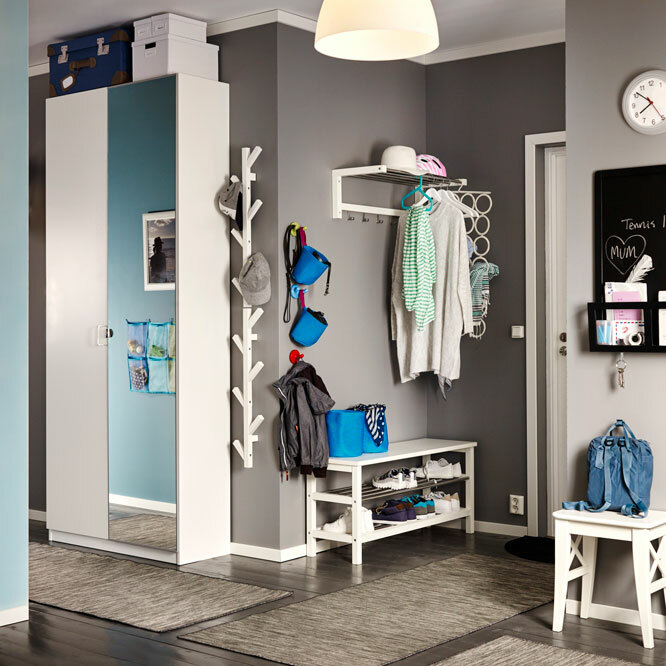 The HEMNES open wardrobes and PINNIG coat racks are a great solution for having your clothes on display. Then add some bold accents, walls in dark colour, black hallway furniture, large mirrors, storage boxes, and voilà! A stylish hallway for a fashion student is finished. How to use a corridor space? Hangers? Check. Shoe racks and benches? Got both of them! Some storage boxes – indeed. With the appropriate hallway furniture, even the narrow corridor in family house can be tidy and functional. Modern design TJUSIG hangers, benches and shoe racks are our recommendation for your modern interior.